Exactly what causes kidney stones is not known. There can be many different reasons. The most common type in about 80% of cases is composed of calcium oxalate crystals. Other types of kidney stones are composed of magnesium, ammonium, phosphate, calcium phosphate and cystine. Uric acid stones are another different type of stone in about 5–10% of cases. Even though calcium is one of the major minerals in kidney stones, research now shows that having a low calcium diet actually increases the incidence of kidney stones. When calcium levels are low your body produces more oxalate which does increase your risk of kidney stones. Usually kidney stones can pass without assistance or are removed from the body without causing permanent damage. However, if a kidney stone blocks urine flow for a period of time, complications can arise. Prevention of kidney stones is important because repeated occurrences of kidney stones increase the risk of developing chronic kidney disease. A complication of kidney stones is the need for invasive treatments. If the stone cannot pass on its own, the first treatment tried is often shockwave lithotripsy. The shockwave lithotripsy procedure uses high-energy sound waves directed at the stone to break it up into smaller pieces so that it may be more easily passed. According to the American National Kidney and Urologic Diseases Information Clearinghouse, more than 5 percent of the US population will have kidney stones, which is probably generalizeable to other countries. Men are more likely than women to acquire kidney stones, particularly between the ages of 40 and 70. For women, the prevalence actually decreases after age 50. Extracorporeal shockwave lithotripsy, or "blasting" of the stones, is a popular treatment for kidney stones. In extracorporeal shockwave lithotripsy, shockwaves that are created outside the body travel through the skin and body tissues until they hit the denser kidney stones. After the stones have been hit, they will break down into sand-like particles that are easily passed through the urinary tract in the urine. Extracorporeal shockwave lithotripsy uses shockwaves to break up stones, so that they can easily pass through the urinary tract. Most people can resume normal activities within a few days. Complications of extracorporeal shockwave lithotripsy include blood in the urine, bruising, and minor discomfort in the back or abdomen. MedWOW features a large selection of new and used lithotripter systems, as well as replacement lithotripter parts from a variety of manufacturers. 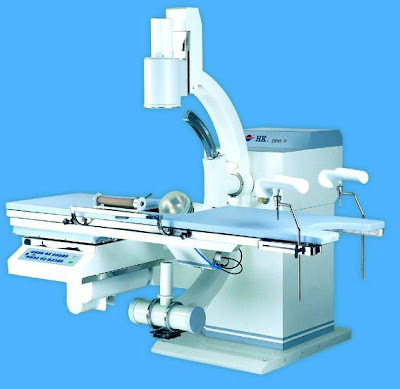 As the principal international eCommerce platform for all kinds of medical equipment, MedWOW, features a sophisticated searchable catalogue that allows you to filter for make, manufacturer, continent, condition, price range, coupling technique, DICOM 3.0 COMPLIANT, type of motor, transducer type, triggering and shockwave type when shopping for a lithotripter. Direx, Philips, Siemens, Waltz, Gyrus Acmi, ENGEMED, Dornier MedTech, Fuzhou Secure, MTS and many more. If you don’t find the exact extracorporeal lithotripter system you are looking for, you can post a free buying request which typically will bring you a number of competitive quotes from MedWOW’s global inventories. The advantages of this technology are represented by the minimal discomfort and short recovery period. here is another interesting article about the subject. MedWOW price ranges for Extracorporeal Lithotripter are mentioned.